Compare prices from multiple car hire suppliers in Funchal Airport to find the best available deal. A few of the car rental companies we compare include Gold Car, Budget, Avis, Hertz, Sixt and many more. The Funchal Airport, formally known as the Madeira Airport (FNC), is an international airport that is located in close proximity to the city of Funchal in the Portuguese archipelago known as Madeira. This airport controls all air traffic for the island. The airport was once known for its tricky, short runway. However, the enlargement of it has won the airport the Outstanding Structures Award by the International Association for Bridge and Structural Engineering. In 2010, the airport provided landing and takeoff for 22,094 planes and offered its services to 2,233,524 passengers from all around the globe. The airport offers its services to a number of international and charter flights, especially during the summer months of May through October. Some of the airlines that fly to this airport include Air Berlin, EasyJet, Finnair, Iberia, Luxair, and Thomas Cook Airlines. 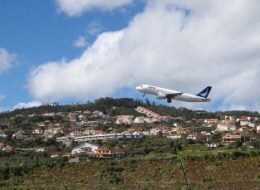 When visitors first enter into the Funchal Airport in Portugal, they are provided with a wide variety of various amenities that can aid them during their stay and make their stay much more pleasurable, including car hire kiosks, shopping opportunities, and areas with all different types of tourist information regarding what to see, do, eat, and stay.